When tooth loss strikes, Dr. Jamie Guthrie offers several quality treatment options that can rebuild both your complete smile and your self-confidence, with dental implants being right at the top of the list. Unlike traditional bridges and dentures, dental implants effectively replicate your entire natural tooth, including the root underneath the gum line that’s often forgotten. This anchored “root” not only makes your tooth replacement much more stable and long-lasting, but it preserves your oral health as well. Contact our practice today to schedule your first appointment! Our team welcomes patients from Lone Grove, OK and other surrounding areas. First, Dr. Guthrie will need to determine whether or not you’re a viable candidate for dental implants. Because implants are placed directly into the jawbone, they require adequate bone structure and generally good oral health. Your new implant(s) will need to be surgically inserted into the bone. For this part of the procedure, Dr. Guthrie will recommend you to a trusted surgical specialist who is located right across the street from our office. Once the implants are securely in place, nature will take over. Over time, your natural tissue will gradually bond with the implants, creating a durable foundation for replacement teeth. Finally, you’ll return to Dr. Guthrie’s Ardmore, OK office so that she can design and place customized restorations on top of the implants, completing your new and improved smile. Our recommendation for your new restoration will depend on the severity of your tooth loss and your personal preferences. It may be a single, all-ceramic crown or an implant-retained bridge/denture that attaches to several implants at once for greater coverage. 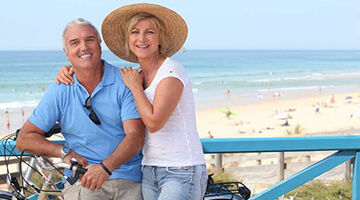 In addition to single and multiple implants, Dr. Guthrie also greatly enjoys providing patients with All-On-4 implant dentures, which consist of four implants placed strategically in the bone in order to support a complete prosthetic. All-on-4 implants provide patients with a fully functioning set of teeth in record time, dramatically improving their chewing ability, dental stability, and much more. Our team looks forward to working with you to determine which tooth replacement solution (implant-retained or otherwise) is the right choice for you! 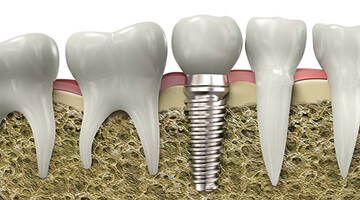 A whole-tooth replacement: Dental implants rebuild from the root to the visible crown, providing the maximum in stability. Improved aesthetics: Dental implants look, fit, and feel completely natural. 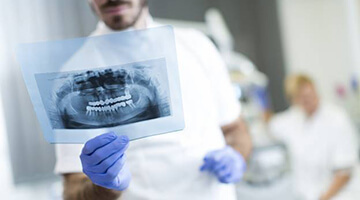 Protect your teeth: The surrounding teeth do not have to be altered as with a fixed bridge, and, by supporting the jaw bone structure, dental implants can help you keep your natural teeth longer. Smart investment: Dental implants can last a lifetime with proper care. Better overall health: A sturdy tooth replacement supports a balanced, nutritious diet. Improved speech: it is easy to speak clearly with dental implants. High success rate: estimates say over 95% of dental implant procedures are successful. It does not matter how many teeth you have lost or from where in the jaw they are missing; dental implants can replace them all. The indications for dental implants are listed below. Just one missing tooth can be replaced with a single crown affixed on top of a sturdy dental implant post. This option is preferable to a fixed bridge because it does not require the alteration of the surrounding teeth. A bridge can be secured on a strategic number of dental implant posts. By filling in the gaps and stabilizing your jaw bone, this option prevents the movement of the surrounding teeth while also preserving bone to help you keep your smile complete. 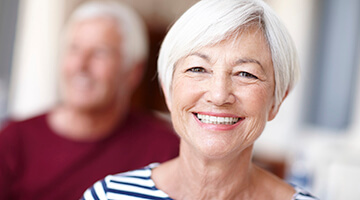 Patients who are missing an entire arch of teeth in the upper or lower jaw can benefit from an implant-supported denture, which provides far superior stability and comfort. No matter the cost of your dental implant procedure, remember -- they are well-worth the investment!